An investigation into floods in north Wales should help to improve future resilience according to the principality's Natural Resources Minister. "This was an extraordinary event and it is fortunate that lives were not lost," said Alun Davies. "This was thanks to the existing defences, effective forecasting and the coordinated efforts of the emergency services and Natural Resources Wales and local authorities." Although Rhyl was the worst-hit by last week's storm surge, problems were felt along the coast. 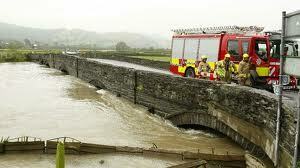 Over 150 homes suffered flooding in the town with 400 people evacuated to safety. The Minister explained that under the Flood and Water Management Act 2010, a local authority normally investigated flooding in its area. However, he has asked Natural Resources Wales to co-ordinate the inquiry as one "comprehensive report is better than three or four separate reports by the relevant local authorities". "The source of the flooding is already fairly well understood but this report should also consider where and why any breaches occurred, show where improvements can be made and help us plan ahead to improve our resilience and response to such events in the future," Davies added. He said since 2011 the Welsh government had provided £20m for improvements to coastal defences along the north Wales coast and a further £9m of works were planned.